Introduction: The introduction of new techniques makes training in advanced laparoscopic procedures a necessity for the practicing surgeon but acquisition of new surgical skills is a daunting task. SAGES has defined guidelines for training and practice of laparoscopic procedures. Recently introduced laparoscopic techniques have created a new teaching paradigm focused on animate courses and preceptor instruction. Aim: To know if surgeons attending advanced laparoscopy courses increase their laparoscopy case load. Methods: After obtaining IRB approval, we performed a survey of surgeons in practice who participated in instructional laparoscopy colon and hernia courses conducted by our department from January 2002 to December 2007. Results: Out of the 109 surgeons, who participated in laparoscopy courses, 79 surveys were administered and 47(59%) responses were received from 41 male and 6 female surgeons. 93% surgeons were in private practice. 58% reported a change in practice after our courses. Of these, 25% surgeons had limited residency laparoscopy exposure of less than 50 cases. The total number of colon procedures for all participants increased six fold and there was an increase in the number of laparoscopic hernia procedures in surgeons who took colon courses. The increase in procedures was statistically significant in surgeons with laparoscopic residency experience of more than 50 cases compared to those with minimal exposure of less than 50 cases. This increase was not found between surgeons with residency experience of 50-200 cases compared to those with more than 200 cases. 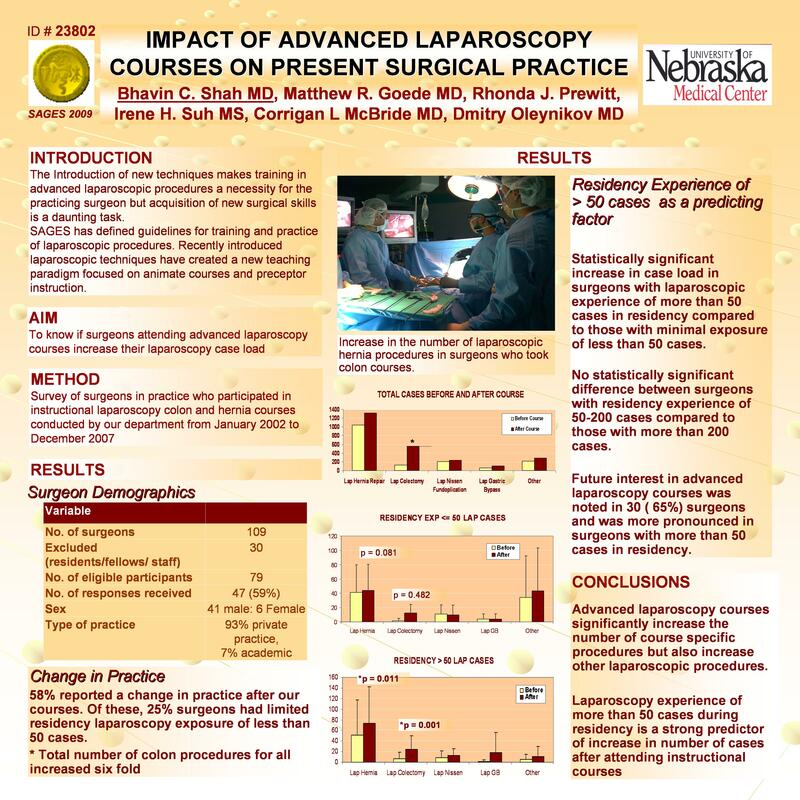 Future interest in advanced laparoscopy courses was noted in 65% surgeons and was more pronounced in surgeons with more than 50 cases in residency.